Established in the year 1970, GPA Capital Foods Pvt. Ltd. ( Formerly known as AgroPure Capital Foods Pvt Ltd ) is a renowned organization, which is highly engaged in importing, supplying, trading, exporting and manufacturing of besan (Desi Chickpeas Flour), entire range of pulses, different variants of wheat flour like Sooji, Maida, Dalia and Poha (Rice Flakes). We have units in and around Delhi (India) and have achieved milling capacity of 800 MT of pulses per day with annual turnover crossing Rs.1000 crores i.e 150 million USD per annum. After securing respectable position nationally, our mission is to cater international markets. In addition, our highly experienced staff enables us to grow progressively in this field by providing our customers with a qualitative range of products. For this, we have developed state-of-the-art manufacturing units, wherein all products are processed under clean & hygienic conditions. Further, for assuring zero impurity, we stringently check the entire range on various parameters Our product engineering skills and R&D Laboratory help us to develop best quality products. Due to our ethical business practices, client-centric approaches and on-time delivery of consignment have enabled us to muster a huge clientele across the world. We have also various quality certification for our products which is considered as a symbol of purity. Agropure's entire range is packed with utmost care, using qualitative packaging material to retain its original properties. Additionally, the range is non-adulterated aud is tested on various parameters to check the adherence of its quality with international standards. For Processing, especially we are using the BUHLER's Colour Sorting Machines of different kinds which lead to accurate detection of defect and foreign matter, produce better quality product. 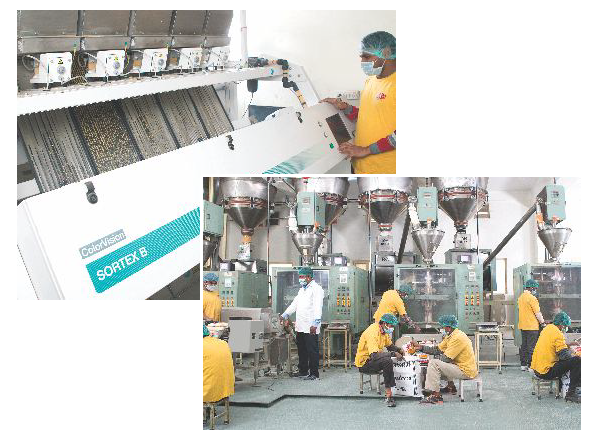 We have 18 kinds of BUHLER color sorting machine used for processing different kind of pulses. Moreover, customers can avail product from us in varied quantity according to their specific requirements. We have established fully Automated packaging unit and standardized storage facility that help us in meeting the immediate requirements of customers, as it has the capacity to accommodate huge quantities. Various material handling equipment are installed al these units so as to facilitate easy, quick & safe loading and unloading of packed products.